Last time I wrote about how to use Excel to create a book map. My friend and editor Travis Perry once declared spreadsheets to be “antithetical to coherent communication,” and maybe you feel the same way, in which case a graphic representation may work better for you. Especially for people who learn visually better than verbally, a diagram like Gustav Freytag’s pyramid structure can provide a framework. On the “Rising Action” part of the structure, you would list your major turning points from bottom to top, with the inciting incident at the bottom and the turning points above it. Because of concerns about permissions I hesitate to share some of the better plot graphs that are floating about the interwebs. But do a search on Google Images or Pinterest for “plot chart template,” and you’ll find an abundance of inspiration. Of course, this kind of chart works best if your plot follows Freytag’s plan or the hero’s journey. If you have a less structured plot, you may need something more like a mind map or flow chart. In that case you may want to draw your plot map freehand on a poster board or butcher paper. If you’re a kinesthetic learner, you may prefer something hands-on instead of digital. There are plenty of options. You can stick Post-it notes on a wall, pin 3 x 5 cards to a bulletin board, write on a white board … anything you can use to get ideas out of your head and into the world where you can manipulate them and see them all at once can work. For more ideas about how to make all sorts of book maps, have a look at Heidi Fiedler’s Pinterest board Book Mapping Like An Editor. She includes examples of all the ideas mentioned above, and a few more besides. 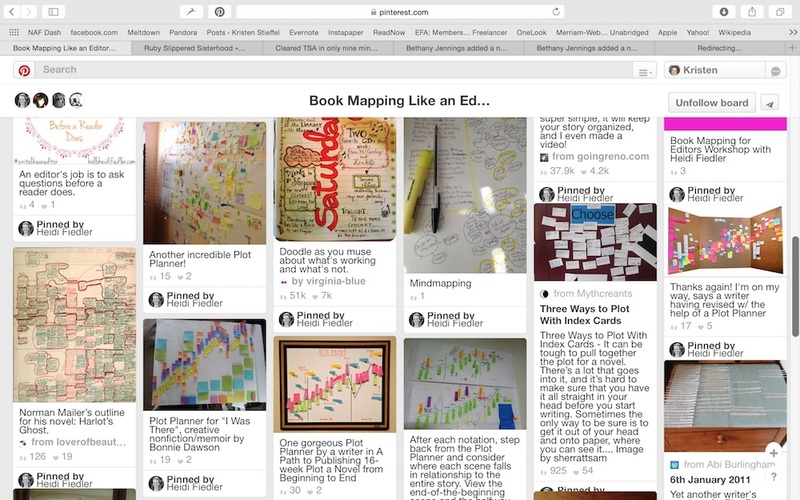 Screenshot of just a part of Heidi Fiedler’s Book Mapping Pinterest board. Your book map can be, and should be, as unique as you and the story you are writing. This entry was posted in Editing and tagged Book Mapping, Edit Like A Pro, Elements of Fiction, Structure.